Music and dance — there was a time when the two were inextricably linked as live arts. Music was written for and tailored to movement; movement was created in conversation with that music; and performance was a continuation of the creative dialogue. But with the increasing availability of recorded music, that standard has changed. Choreographers save money by forgoing live music and commissioned scores, and musicians lose nothing by taking on more lucrative gigs. Thus was planted the seed for Periapsis Music and Dance, Katz and Schanfein’s venture to bring composers and choreographers, musicians and dancers together in the studio and on the stage. What began as a mere mutual thought last September blossomed into a full-fledged show in February, and will fuel the production of two more performances this month, at the Secret Theater in Queens on May 16 and the Actor’s Fund Arts Center in Brooklyn on May 20. Leigh Schanfein and Mike Hodge in rehearsal. Photo by Alex Agor. Though their first collaboration dates back only a year, Schanfein and Katz now find themselves facilitating what they hope will become a large-scale movement to reunite and revivify their artforms. Considering the massive response they gleaned from their initial calls for composers and choreographers, there is more than enough momentum coming from their respective realms to turn their vision into a reality. Schanfein received similarly enthusiastic responses from the four other choreographers on Periapsis’ inaugural program, all of whom enjoyed some level of interaction with the composers behind their chosen music. A high priority for next year’s projects is to increase coactivity amongst participants, allowing for a more integrated creative product. But heightening the artistic intensity of their work will likely prove to be somewhat of a creative release, given the plethora of logistical challenges Schanfein and Katz have faced in the less than six months they spent producing their first show. Of primary concern is, unsurprisingly, funding — an aspect of Periapsis’ well-being that its directors are determined to stay on top of. 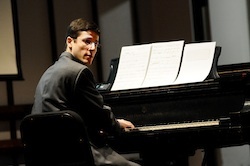 Composer Jonathan Howard Katz at the USF Robert Helps Competition and Festival. Photo by Kyle Scharf. Finding suitable performance venues for Periapsis is another problematic task, considering the various technical requirements of productions incorporating not just one, but two live arts. Quality of acoustics, proper flooring, availability of less transportable instruments (pianos, drums), soundproof rehearsal rooms, warm-up studios — Katz and Schanfein take all of these details into account when scouting venues. 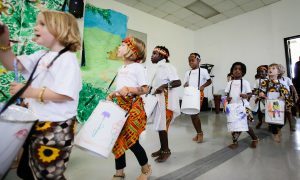 And when the pair is not scouring the city for the perfect performance space or piecing together a non-profit budget, they are making moves to cultivate an audience and get more people involved in their cause. The greater their following, they believe, the greater the opportunities for their fellow artists. 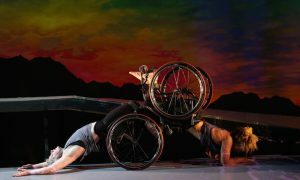 To learn more about Periapsis Music and Dance, or to find out how you can become a part of its next season, head to periapsismusicanddance.org to snag a ticket to one of the group’s spring shows. Photo (top): Dancer Robin Gilbert in a Periapsis Music and Dance rehearsal. Photo by Alex Agor.